Yesterday, as a shareholder’s representative, we attended the Annual General Meeting of ASPEQ. This company is wholly owned by the aviation community and is a spin out from the creation of the Civil Aviation Authority in the early 1990’s. There was some discussion as to what this company is actually worth however for an investment of $5,000 its a pretty interesting example of getting the business model right accompanied by excellent stewardship,governance and management of the entity. Bruce Heesterman returns as ASPEQ’s CEO to brief you on the company’s performance and future. A few weeks ago I was privileged to write this comment wearing my Director of the Governance Board hat; this week I get to write from the perspective of my day job as CEO of Aspeq. Aspeq is 50% owned by Aviation NZ and has been around for over 21 years delivering aviation exams under a delegation from CAA. The past week has seen us hold our AGM here in Wellington and also issue a press release about our exciting and big win in the United Kingdom both of which are catalysts for this comment. So who or what is Aspeq? Aspeq is the group company for a variety of subsidiaries and including ASL that delivers examinations and flight tests for flight crew and aircraft maintenance engineers throughout New Zealand. Because the company has diversified both geographically and industry-wise it makes sense to have a group structure that is responsible for all the common activities like IT, business development, finance, quality and question bank development and maintenance and a series of operating subsidiaries. Currently we have 38 permanent staff including 4 in Canberra and 180-200 part time exam supervisors, proof-readers or subject matter experts around Australasia. We are governed by an independent Board of Directors appointed by our two shareholders. A global aviation business delivering about 40,000 flight crew and engineering exams throughout New Zealand, Australia Singapore and Malaysia as well as some exams for Hong Kong and Macau From March 2014 will deliver about 40,000 additional exams in the UK and some of their 8-9 foreign exam locations like UAE, Jordan, Florida, Nepal and so on. On top of this we have contracts in Australia to produce exams in the maritime industry and the finance sector and over the past 4 or 5 years have tested 23,000 master builders and 4000 financial advisers in New Zealand. We have nearly 60 exam venues in Australia and New Zealand. So what is an aviation company doing in non aviation industries? And what is a New Zealand company doing in strange locations like Nepal or Kuwait? The answers are pretty straight forward: it produces resilience from cyclical shocks in NZ and/or in aviation and produces economies of scale that benefit all users. By way of example the last two or so years has seen pilot training numbers in NZ plummet by over 30% and all other things being equal we would have needed to raise exam prices by a similar amount. Instead, because of Aspeq's diversification, we've been able to hold our price increases to just track inflation. Financial Performnce - 2012/13 year, our revenue was a bit short of $7m pa and we made an operational profit of about nearly $400k and made a small after tax loss. We spend a significant amount of capital each year (new questions and new software mostly) and pay a dividend to the two shareholders each year too. All our profit is reinvested in the business to grow new opportunities and build some very smart and innovative software. In the current year we expect revenue to be well above $8m and profit after tax in the black. Tracking customer satisfaction quarterly and it is currently slowly trending upwards from 83% (people who think we do a good or excellent job) and our staff engagement is also trending up having us in the top 30% of New Zealand businesses as great place to work. We currently deliver about 40,000 exams each year that will grow to 80,000pa over the next 6-9 months and we see that there is significantly more to come as our business development brings in more work. Currently about 60% of our revenue is non-New Zealand and this will undoubtedly grow in the next few years too. The Future – Markets and Sector currently we are looking to build on the contract with the Australian Security and Investment Commission (ASIC), talking to the Victoria State Taxi Drivers Federation, have aviation exam bids in Kuwait, Brunei, Slovenia, Nepal and Lebanon. We are talking to the maritime regulator in Singapore and Lebanon and in 2014 will launch a new e-licensing software product to the aviation scene. Strong commitment to quality and as well as being ISO9001 certified we are seeking ISO27001 certification for data security and during the year are audited by most of our major customers including CAA NZ. In the end our ability to keep work or sell new work rests on the ability to convince regulators that we can be trusted to deliver high quality exams reliably. Our two unique selling propositions are the ability to develop and maintain many thousands of questions written against a syllabus and to create innovative software that can be deployed anywhere in the world. The other unique aspect of the business is that our target customers are regulators who are quite careful and considered when procuring services and thus from first sales call to contracting stage is typically around 24 months; in the case of the CAA UK it was a five year marathon to win that work. Having won work however we usually have contracts that are 3 or 5 years with a right of renewal on top of that so that hard work does pay off over time. The world of pilots and engineers is very global and becoming more complex. We deliver exams to the Hong Kong origin pilots in Hamilton and Adelaide using the CAA UK questions. We deliver our own EASA pilot questions to Singapore candidates in Singapore and are likely soon to deliver those same questions in Hamilton and the UK. We have access through our CAA International partner to EASA flight crew and engineering questions and the CAA UK contract will see us target work in European states from mid 2014. 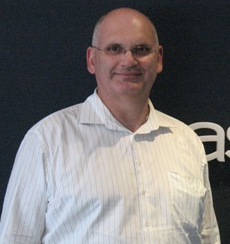 I recently attended Safeskies conference in Canberra and was talking to a senior RAAF person who was amazed to learn of Aspeq and what we did. His response was “why does NZ always come up with these good ideas not Australia?” A great question I suppose and the reality is that Aspeq and its people have invested considerable time and effort building a strong brand, great systems and ICT solutions and the win in the UK I think will see us expand even faster than before. While our focus outside of the UK has been Asia and the Middle East, we remain open to the opportunities that might present in other regions such as South America or perhaps the “Stans” above Asia and below Europe. One thing is certain we value our New Zealand base. Whether we are selling aviation or not, the fact that we are from New Zealand is incredibly important to the process of building a relationship with prospective customers. New Zealand is seen as innovative, nimble, safe and non-corrupt; all attributes that are vital to win work from regulators around the world. Aspeq turned 21 this past July and I think is poised to make pretty big mark on the global high stake examination market in the next few years. In my work as a forensic engineer and independent air accident investigator, I am continually surprised at how often the ‘system’ contributes to the failure or accident or ‘The Problem’. By ‘system’ I mean the regulator, investigation body, Standard Operating Procedure(SOP), textbook, Industry Standard, Rule or Law. Of course attributing fault or cause or blame is never a simple process and there are normally many contributing factors. However in at least 50% of the investigations that I have undertaken over the past 10 years, some part of the system has contributed to the failure. At first glance, it often looks like an individual or company is at fault. But only after several layers of evidence and history are peeled back, do the system faults emerge. Those of us who are unlucky enough to go through an investigation experience might privately think of the many times we ‘goofed’ and relate this to the failure or accident situation. After all we as humans are often guilty of making mistakes, and ‘if you are unlucky enough to get caught, that’s just how it is’- so the thinking might go. But if instead our minds considered the more probable scenario of multiple causes- which is what you might expect if the system was supposed to have multiple defences- you might be a little more forgiving of yourself, and also the unlucky person who just got pinged. Now imagine something totally different. Imagine you were an engineer responsible for designing a new machine that would radically improve everyone’s lives and be used everywhere in the world by a wide range of people and cultures. You had carried out a comprehensive range of tests and now it was ready to go to market. However, soon after the launch they began to fail-but only one at a time. After the first failure you might investigate the event thoroughly hoping it was an isolated case, but as they continued to fail you would need to adopt a more ‘global’ perspective, looking for trends and information across the board that could hopefully be utilised to design a single fix that could be installed in all of the machines. You wouldn’t stop at investigating just one, would you? Now contrast this with what happens in a criminal court in which attention is focussed solely on the case in question. Take a person on trial for murder for example. It makes less sense for a court to investigate the motives and circumstances of other murderers who killed in similar circumstances than it does for an engineer to investigate other machines that failed in similar situations. So why might that be? Perhaps it has something to do with ‘motive’ and the idea that the murderer wanted to commit his crime whereas a machine has no will. In his latest book James Reason refers to David Marx’s work on ‘criminal’ human error. Marx cites the US Supreme Court tracing the birth of ‘criminal’ error to the onset of the Industrial Revolution. Prior to that, a criminal prosecution for criminal error needed proof of both the ‘Motive’ and the ‘Act.’ However, it soon became apparent that industrial accidents could occur without any conscious thought involved and so the ‘Motive’ part of the equation became irrelevant. This meant less work for the prosecution and more work for the defendant who had to prove total absence of fault on the balance of probabilities. Previously it had been the prosecution’s responsibility to prove guilt beyond reasonable doubt. If you hear the legal term ‘Strict Liability’, that’s what it’s about. You might think of this as a hangover from the medieval era. Fast forward to 2013. Today we know about multiple causes and human factors and complex technology. We are only beginning to learn what we don’t know about the human ‘machine’ and it’s looking pretty complex. Isn’t it time to give it the same courtesy that we would give a mechanical machine and investigate the intricate circumstances of a human fault as comprehensively as we would a machine failure? After all the human is a bit like a machine with a computer brain that doesn’t always know its own mind, can’t always choose to remember what it wants to and finds it even more difficult to forget what it would like to. Perhaps the human machine was released to the market prematurely. As with the criminal court process, the international ICAO air accident investigation protocol – i.e. Appendix 13, is most often confined to the accident at hand particularly in General Aviation. It’s as if the accident is assumed to be a ‘one off’ without any other similar accidents having occurred previously. This assumption is often wrong; lessons from previous relevant flight safety events have been learned elsewhere but have not been widely distributed. Associations of flight safety investigators do their best to share knowledge of this type but the scale of the information transfer is limited and possibly curtailed by legal requirements. With this perception, it’s difficult to justify a database or classification protocol to log the failure of interest for future monitoring and trend analysis. Without this information, an investigator is less able to communicate with other investigators who have encountered similar accidents or problems. Consequently all eyes are on the accident participants but no one is watching the system. The accident investigation becomes a pseudo court- the medieval type mentioned earlier. My vision for the future of accident investigation and prevention is that one day there will be a comprehensive data base of accident information from which detailed and informative trends can be derived, that in turn can lead to a better understanding of how the human/machine interface works at all levels of human endeavour; at the organisational, corporate and individual areas. To do this, a searchable cataloguing system with an extensive network of vertical and lateral links –perhaps similar to Google and Facebook search engine devices, would need to be developed that all investigators could utilise. This would help them uncover, assess, conclude and catalogue complex and multiple causal mechanisms enabling stronger supporting evidence for those difficult and expensive recommendations. It is likely that such an exercise would show that language is incapable of properly representing the complete causal picture and a new language of logic diagrams and symbols would need to be formed to handle the complexity- as we have easily done with electrical circuit diagrams. However, lawyers and judges may no longer be able to utilise their traditional legal tools to assess cause and responsibility. Then with our good friends in the legal industry better informed, a different type of open forum might evolve- one in which we could all practise a little more professionally and hopefully learn- as we did when we developed and improved our physical machines, how to properly discover what went wrong. 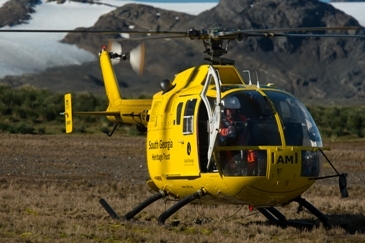 The Department of Conservation has published details of proposed concession licences for aircraft landings in Mount Aspiring National Park and other sites in western Otago. Contact: Richard Clarke - 03 474 6956; rclarke@doc.govt.nz. 29 November GD on Colour Vision - note submissions deferred until March 7. There have been some issues in the production of information . 12 December ACAG annual meeting and election forum. Welligton Airport Conference Centre. On Friday March the 1st 2013, I departed Christchurch Airport bound for South Georgia Island in the South Atlantic Ocean deep within the Antarctic conversion zone to join an international team of 27 who had sailed to South Georgia from the Falkland Islands some 4 weeks prior to lay out the depots for the largest Island pest eradication program ever attempted. Using 3 twin engine BO105 helicopters we covered 55,000 ha’s in the second of three phases to treat rat and mouse habitat with Brodifacoum cereal bait over a three month period often in conditions where we would normally tell the “Boss” to stick it where the sun doesn’t shine and put the feet up in front of the fire! The program run by the South Georgia Heritage Trust (SGHT) included 6 Kiwi’s. Peter Garden (chief pilot), Dave Mclaughlin (pilot), Mark Paulin (chief engineer), Keith Springer & Nick Torr (eradication experts with experience all around the world) and myself as the 3rd baiting pilot. The aircraft were all UK registered so we obtained temporary validations from the UK CAA to undertake operations – pleased to report that the bureaucratic process is alive and kicking there as well! There was an additional UK rated pilot – George Phillips - our flight safety officer with vast experience in SAR and EMS ops in the UK. Average pilot age between the four us was 58 – hmmmm…………. Kiwis are well sought after for these types of operations in recognition of our experience in pest eradication – not just pilots but strategist’s and managers as well. Where the hell is South Georgia? In July 2012 Peter asked if I wanted to join the team going to South Georgia – that’s in the USA right? Ok then it’s in the tropics so a working holiday in the sun would be a good lark? Yeah right! A quick Google search pulled up a reality check – out with the T shirt and jandals - in with the long john’s! South Georgia lies at Latitude 54˚ South 1750 kms east of the southern tip of South America, 1500 kms from the Antarctic Peninsula covering 3750 square kms of which 20% is infested with rodents. It is in the middle of the Antarctic Circumpolar Current (ACC) that flows thru the Drake Passage into the Scotia Sea effectively surrounding South Georgia with cold Antarctic water. Snow and ice covered mountain ranges run like a spine the entire 170km length of the Island with Mt Paget being the highest peak at 2934 metres. These mountains rise almost inexplicably straight out of the sea, hundreds of miles from any other significant land form. 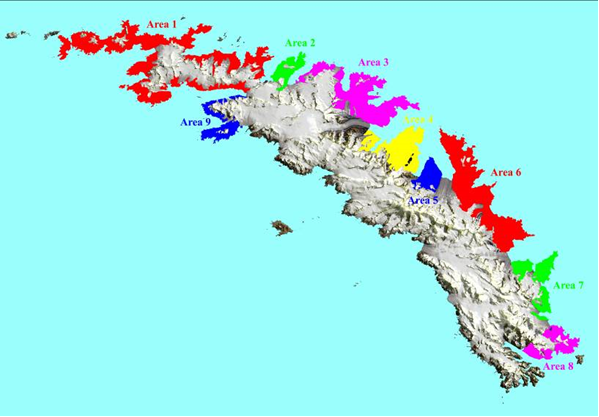 Approximately half the Island is covered in permanent ice and the permanent snowline begins at 300 – 400 metres above sea level. Heavy glaciated valleys extend from the high ice fields down to the sea. If you imagine standing at the Mt John observatory looking at Mt Cook – take an ice-cream slice of the Southern Alps – plonk it in the middle of the South Atlantic 1500 kms from nowhere – you are now looking at South Georgia. The cooling effect of the ACC produces a cold, wet, and windy maritime climate typically resulting in precipitation 300 days a year. South Georgia is the first significant landform reached by the moisture laden westerly winds generated in the Antarctic region. The mountain ranges result in orographic winds that produce copious quantities of snow that top up the névé’s and ice fields that feed numerous glaciers. On the lee side of the mountain ranges the winds funnel down the glacial valleys that generate violent gusts and severe turbulence. The average winter temperature at sea level is 0˚C to -1˚C and in summer 3˚C to 5˚C. Weather changes can be unbelievably rapid with dramatic temperature changes occurring in minutes. 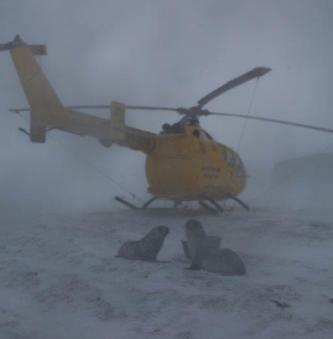 Completing some 600 flight hours, the BO105 was an ideal aircraft to operate in these conditions. For four and half months they were exposed to the elements both in flight and on the ground that other aircraft types simply would not have withstood. The aircraft is a delight to fly and feels comfortable in strong winds and turbulence that would be unsettling in many other medium types of aircraft. A successful eradication operation on South Georgia must take account of the fact that the island is many times larger than any previously targeted for pest eradication and that the financial resources potentially available to fund the work are limited because they are privately raised. Phase 1 was to be a trial of equipment, techniques, logistics and personnel on a meaningful area of land, but with the safeguard of knowing that any errors made could have but limited effect on an island-wide scale. This Phase was carried out in March 2011. 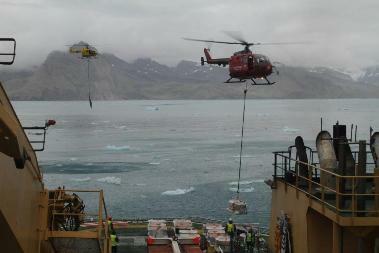 The operational work was a success with the work completed in 28 days. In July 2013, following post operational monitoring, the Phase 1 area was declared rodent free. Rats have been successfully eradicated from 128 square kms of land (areas 1, & 5) – 22% of the land mass. Phase 2 is a two-season operation to treat the remaining 88% of land mass. The first of these we completed between February and June this year (areas 1, 2, 3 & 9) with the remaining area planned to be treated in 2015 (areas 6, 7 & 8). Logistically it is possible to cover such a large land mass over a number of years thanks to the glaciers that form natural barriers to rodent re-infestation of treated areas – as depicted by the map. Reindeer were introduced to the Island in the early 1900’s as a source of fresh meat for the 6 whaling stations on the island. As part of the eradication program they are being culled ahead of the baiting operations. 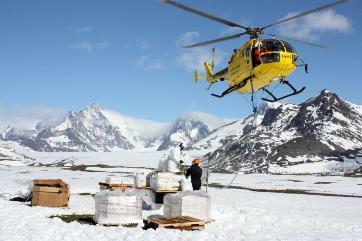 A team of Norwegian cullers eradicated some 1900 reindeer in January prior to our arrival at a cost of some £500,000-00! The helicopters would have done the job at a fraction of the cost however the South Georgia Government considered helicopter culling to be inhumane!! Apparently herding them into portable yards then running them up a chute and cutting their throats is much more acceptable ……………… let’s just leave that one there shall we. South Georgia has an abundance of wildlife in the form of sea birds and sea creatures, Albatross, Penguins of several species, Petrels, Ducks, Pipits, Skua Gulls, Elephant seals, Fur seals, Leopard seals to name a few. The lower slopes are heavily vegetated – reminiscent of McKenzie Country tussock lands with a predominant tussock that resembles snow tussock but with a broader coarser leaf interspersed with swamplands full of colorful beds of moss and lichen’s. The introduction of Norway rats and field mice has had a significant impact on this harsh but fragile eco-system. 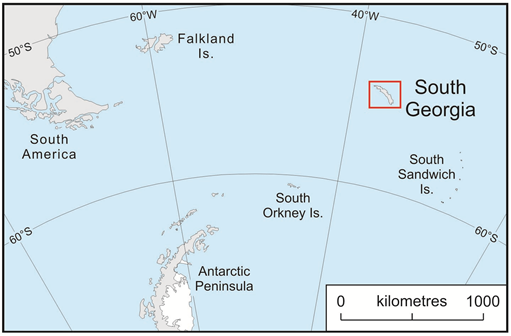 South Georgia has a rich human history dating back to 1775 when Cook sailed into Possession Bay and claimed the Island for the British – now disputed by Argentina as they continue to lay claim to the “Malvinas’”. Cook documented the abundance of seals so in short time the sealer’s arrived and undoubtedly some of their stowaways made it ashore and so began the incursion of rodents that spread far and wide around the island as they landed in the various regions. By the end of the 1800’s it was a rarity to sight a seal on South Georgia. Whales had populated the bays to feed on the huge abundance of Krill – the catalyst for a burgeoning whaling industry that began in 1901 and ended in 1964 having totally decimated the whale population. Today it a rarity to sight a whale in proximity to the island but once again the krill stocks were in overabundance and that was the catalyst for the seals to repopulate – they are like rabbits all around the island – I kid you not! 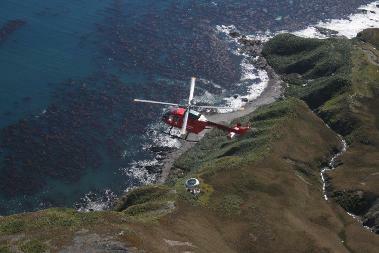 In 1916 Shackelton made land fall in King Haakon Bay at the end of an epic voyage in a long boat from Elephant Island. On the 20th of May he and two crew walked into Stromness whaling station having crossed the Island in 36 hours. We had the privilege of flying their route multiple times and can only reflect in awe at this super human feat. Shackelton is buried at Grytviken on the eastern side of the island. Militarily South Georgia was the spark that ignited the Falklands conflict and there is a brief but rich history of the conflict that is still evident today with downed helicopters still lying where they came to rest. For those interested in the helicopter history of the conflict there is a book titled “Scram” that contains many meaningful lessons for any pilot. Today South Georgia has a summer population of around forty stationed at King Edward Point of which only around nine winters over. Some are government officers who oversee the fishing and tourist industry. 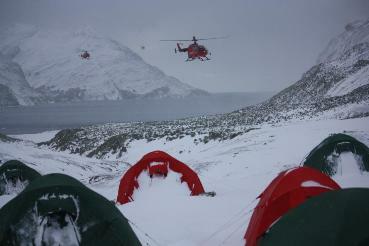 The balance is scientists and personnel attached to the British Antarctic Survey program. Across the board NZ aviation has been exporting expertise since man decided to defy gravity. Our pilot skills and aviation technology are recognized internationally that are an outcome of innovation borne of need – the needs of burgeoning industries in NZ such as farming, pest eradication, public transport, oil & gas … and so on … and so on. The “needs” haven’t gone away – in fact they are growing – but they are growing in an ever demanding soci ety that is intolerant of screw ups. Today’s society demands high standards and is quick to turn on those who are seen to transgress. The outcomes of the Pike River mine disaster will have a significant impact on our industry in very short time. To maintain our reputation both domestically and internationally we must be proactive in meeting society’s expectations. The NZ Aviation community is already taking advantage of our reputation, skills and technology on the international stage. The challenge is to not only maintain this - but grow it.